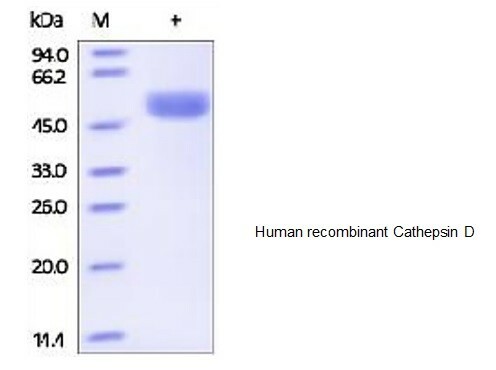 Human CellExp™ Cathepsin D, human recombinant | 7409 | BioVision, Inc.
Lyophilized from 0.22 μm filtered solution in 50 mM MES, pH 6.5 with 100 mM NaCl. Generally 5-8% Mannitol or trehalose is added as a protectant before lyophilization. This protein is fused with polyhistidine tag at the C-terminus, has a calculated MW of 43.6 kDa. The predicted N-terminus is Ser 19. DTT-reduced Protein migrates as 45-55 kDa due to glycosylation. Measured by its ability to cleave the fluorogenic peptide substrate, Mca-PLGL-Dpa-AR-NH2. The specific activity is >450 pmol/min/µg. Cathepsin D is also known as CTSD, CPSD, which belongs to the peptidase A1 family. Cathepsin D can be cleaved into the following 2 chains: cathepsin D light chain and cathepsin D heavy chain, which is expressed in the aorta extracellular space (at protein level). The catalytic activity of Cathepsin D is specificity similar to, but narrower than, that of pepsin A. Cathepsin D does not cleave the 4-Gln-|-His-5 bond in B chain of insulin. Cathepsin D involved in the pathogenesis of several diseases such as breast cancer and possibly Alzheimer disease.